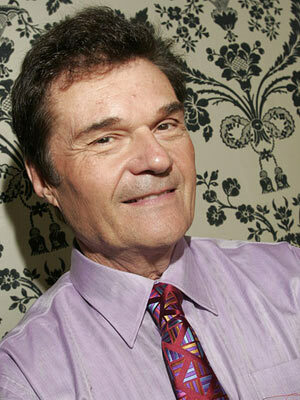 Fred Willard is an American actor, comedian, and voice over actor, best known for his improvisational comedy skills. He is known for his roles in the Christopher Guest mockumentary films This is Spinal Tap, Waiting for Guffman, Best in Show, A Mighty Wind, and For Your Consideration as well as television series D.C. Follies. He is an alumnus of The Second City comedy troupe. He received three Emmy nominations for his recurring role on the TV series Everybody Loves Raymond as Robert Barone's father-in-law, Hank MacDougall. In 2010, he received an Emmy nomination for Outstanding Guest Actor in a Comedy Series for his role on the ABC TV series "Modern Family" as Phil Dunphy's father, Frank Dunphy. Willard grew up in Cleveland, Ohio. His father died in 1951. Willard is a former U.S. soldier, having graduated from the Kentucky Military Institute and the Virginia Military Institute. After his tour in the Army, Willard auditioned alongside Robert Klein for The Second City, which consisted of a nightclub manager and his employee. The audition helped the two secure the job. He is an alumnus of The Second City and currently heads a sketch comedy workshop, The MoHos. He was a founding member of the improvisational comedy group, Ace Trucking Company. Fellow members of Ace included Bill Saluga and Patti Deutsch, among others. They appeared regularly on This is Tom Jones. In a December 2010 interview with online film magazine mondo-video.com, Willard talked in detail of his coming of age in Cleveland, Ohio, and being influenced by seeing comedian Spike Jones live in concert, "when I was a kid, I saw something in Cleveland that really influenced me. I saw Spike Jones on stage in Cleveland. And I had never seen comedy like this before. It was all new to me. I remember musicians on stage, and they’d do take-offs of popular songs. There was this one bit they did with a woman on stage with a harp. She sat there the whole show and never played it, and no one on stage drew any attention to her. I couldn’t believe just how hip this type of humor was. It was cutting edge for back then". Willard achieved wider fame as Martin Mull's impossibly dense sidekick, "Jerry Hubbard," on the television shows Fernwood 2 Night, Forever Fernwood, and America 2-Night, which parodied the nighttime talk shows of the day. He was an original cast member of the NBC comedy series Real People from 1979 to 1985. From 1987 to 1989, he starred as a bartender/straightman in Sid and Marty Krofft's D.C. Follies, where all the other regular characters were Krofft puppets portraying political figures of the time. In 1990, Willard hosted the cable TV show "Access America" on the Ha! Comedy Network. As part of that show, he appeared September 21, 1990 on Episode #7 of the cult Public-access television show Decoupage with Summer Caprice. In 1995, Willard reunited with his Fernwood co-star playing Scott, the romantic partner of Mull's character, Leon Carp, on Roseanne. The couple married in the episode "December Bride" and Scott became a recurring character during the series' final two seasons. That same year, Willard had guest starred in three episodes of Sister, Sister, starring Tia and Tamera Mowry; Willard played Carl Mitushka, a teacher at Roosevelt High who often spoke popular teenage slang terms in order to sound cool to his students. Willard guest-voiced a 1999 episode of The Simpsons titled Sunday, Cruddy Sunday as Wally Kogen, a travel agent. From 2001 to 2002, he played the father of five children on Maybe It's Me. He has also guest starred in an episode of The Weird Al Show. His most recent notable work has been in Christopher Guest films, such as A Mighty Wind, in which he played "Mike LaFontaine", a character known for his catchphrase, "Eh? Wha' happened? "; Best in Show, in which he portrayed "Buck Laughlin," a dog show announcer who offered up an unending stream of bad jokes and off-color comments; Waiting for Guffman, in which he played "Ron Albertson," a travel agent who performs in amateur stage productions with his wife; This Is Spinal Tap, in which he played a lieutenant on the military base where Spinal Tap play; and For Your Consideration, as an obnoxious entertainment television show anchor. He also appeared as KVWN news director "Ed Harken" in, Anchorman: The Legend of Ron Burgundy, and in American Wedding as Michelle Flaherty's father, "Harold." Willard frequently appears in sketches on The Tonight Show with Jay Leno, typically as a government official, businessman, or other authority figure named Willard J. Fredericks, who is always drinking. He also hosted Saturday Night Live in 1978 and appeared twice on SNL's rival show, MADtv. Two years before this, he made a minor appearance in the movie Silver Streak as a bemused railway station worker. He was the voice of a clueless companion to a lazy robot in one episode of the series Dexter's Laboratory and guest-starred on the Adult Swim cartoon, Tom Goes to the Mayor. He acted in the Cartoon Network movie Re-Animated and played Vala Mal Doran's "father" in an episode of Stargate SG-1 in 2007. He appeared in an episode of the Adult Swim program Tim and Eric Awesome Show, Great Job!. He has also starred as the "Boogie Man" in an episode of The Grim Adventures of Billy and Mandy and reprised his role in the movie, Billy & Mandy's Big Boogey Adventure. His final appearance as "Boogey" occurred in Billy & Mandy: Wrath of the Spider Queen. In 2007, he made a guest appearance on the children's TV series Come on Over. He's also guest-starred on an episode of The Boondocks providing the voice of "Joe Petto." In 2008, he guest starred on Transformers Animated as the Decepticon arms dealer Swindle. Willard completed a sold-out run of Fred Willard: Alone At Last!, advertised as a one-man show but actually featuring a cast of 10, and received Los Angeles Artistic Director Awards for Best Comedy and Best Production. He has completed a RiffTrax with Michael J. Nelson for the movie Missile to the Moon. Willard was part of the one-night celebrity performed staging of Howard Ashman's unproduced musical Dreamstuff. The musical was re-imagined by Howard's partners Marsha Malamet and Dennis Green and performed one night only at Los Angeles' Hayworth Theatre as part of the Bruno Kirby celebrity reading series, directed by Ugly Betty's Michael Urie. Willard starred in the show alongside Eden Espinosa, Vicki Lewis, David Blue and Luke Macfarlane. Willard played the father of Phil in the episodes "Undeck the Halls" and "Travels with Scout" of the show Modern Family. He will return in the same role next season. Whole or part of the information contained in this card come from the Wikipedia article "Fred Willard", licensed under CC-BY-SA full list of contributors here.